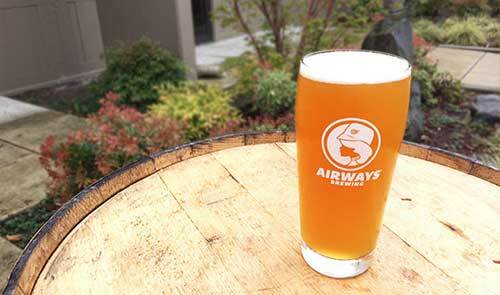 Today we’re welcoming our newest seasonal into the Airways IPA lineup: Spiral Staircase. The way our super expressive, English yeast strain interacts with the crazy amount of Mosaic hops we added, produces a beer rich in mango, lemon, and stone fruit notes. An almost all Pilsner malt base gives it a bit of a cracker-like finish. So far, when we’ve taken samples of this beer out to some of our retailer friends, we’ve heard things like “Oh my god” and “I want more of this right now.” We think you’ll like it a lot. We do. 6.7% ABV. As far as IBUs – if you really care still – maybe around 50. Available starting today in The Tap Room & Brewery and at The Bistro in Downtown Kent. Yes, to growlers.